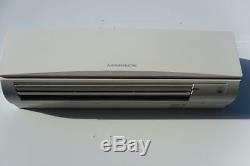 Mitsubishi wall mounted air conditioning unit 7.6 kw price includes fitting. Air Conditioning to suit YOUR Budget. Specialists in factory reconditioned air conditioning systems. Supplied and installed package deals. Server Room & Close Control AC. Air Conditioning to suit your Budget. Can you install to my premises? How quickly can you install? This system does not suit my needs, are there other systems available? For answers to these questions or any you may have you the ask question or see the business contact information at the bottom of the page. Mitsubishi electric Power Inverter 7.6 Kw heat pump wall mounted air conditioning system, The price here is for the complete air conditioning system, fully supplied and fitted to your premises. This listing is for a factory reconditioned Mitsubishi electric 7.6 kw wall mounted split system inverter driven heat pump system, fully fitted to your premises including all materials and labour The Mitsubishi Power inverter systems are one of the most energy efficient air conditioning systems on the market today, the inverter drive system is up to 45% more energy efficient when compared to conventional air conditoning systems. Energy savings are up to 45% when using the latest inverter technology. Mitsubishi electric is the premier brand in air conditioning, Their power inverter system is their flagship product. Please read the standard fitting service details in the tab below, this outlines what is included in the price. Also included in the price is travelling of up to 40 miles from central London, we do cover all of the U. Mainland for installations but there are additional charges for travelling longer distances, please enquire with your postcode for travelling charges. The standard fitting service package is inclusive of all materials and labour required to fit the system to your premises, this includes all of the pipe and communicating cables for up to a distance of 10 metres between the indoor and outdoor unit, (in most cases 10 metres is more than enough) We can, of course accommodate longer pipe runs up to a maximum of 70 metres, please call for a quote for additional pipe run charges. Please note that we do not run the electrical power supply to the outdoor unit, this should be done by a qualified NIC registered electrician, we do run and commission your system on a temporary power supply so you can see it functioning and we can give you training in how to operate the system correctly and efficiently. Our installation service covers the whole of the U. Ireland, when the distance is greater than the 50 miles included in the standard fitting service there is an additional charge to cover the cost of travelling, diesel etc, please telephone for details, N. All in all, you are completely covered. We have a large stock of systems, many more that are listed here, please ask for details, we can set up a listing for the specific unit that you require. For supplied and fitted packages, the air conditioning system will be delivered free of charge by our engineers that will come to fit the system. The item "Mitsubishi wall mounted air conditioning unit 7.6 kw price includes fitting" is in sale since Monday, December 05, 2016. This item is in the category "Home, Furniture & DIY\Heating, Cooling & Air\Air Conditioning". 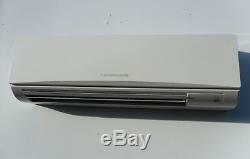 The seller is "budgetairconditioningdotbiz" and is located in london. This item can be shipped to United Kingdom.